The grape, one of the most highly prized fruits, is grown worldwide, both in gardens and vineyards where climate allows. In some less-favoured areas, the garden vine can be successfully grown against walls or in a glasshouse which, if suitably heated, can produce good crops, even of the highest-quality cultivars. The cultivation of the vine dates back to ancient times; it is thought to have spread from Anatolia to Syria and then to Palestine by 5000 BC or even earlier. Vine growing is indicated by grape seeds found in Early Bronze Age sites at Jericho and Lachish. 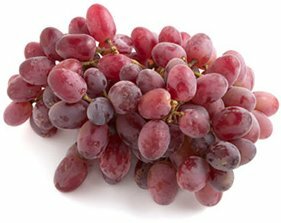 As in the case of so many hardy fruits, the grape was then introduced west and north and also to Egypt, and the fruit figures prominently in Greek and Roman literature, as well as in the Bible. By the 5th century BC the wine trade in the Mediterranean was well established and by the 1st century BC Italian vineyards were exporting very large amounts of wine. During the same period the vine was established in southern Spain and the south of France, and later in North Africa which, by the 3rd century, began to supplant the Italian trade. The speed of viticulture northwards continued under Roman influence. By 600 AD all climatically favourable areas of France – first the southwest centred on Bordeaux, then through central and eastern France to the German border – saw viticulture firmly established; within the next two centuries it reached Germany and southern Britain. The vine’s slow progress northwards can probably be explained by Rome’s rigid legislation that restricted planting to cereals and other essential foodstuffs. Excavations show that grapes were cultivated in Britain during the Roman occupation, though not extensively. Later they were grown with increasing success in monastic gardens, and by the time of the Domesday Book no fewer than 38 vineyards were recorded in the south of England from Kent to Dorset and Gloucestershire. The Norman Conquest brought the introduction and apparently successful cultivation of many cultivars from Europe. Imports of superior wine gradually undermined the importance of the home-grown product, and viticulture in Britain declined. In the 14th century, particularly unfavourable weather conditions and the demographic effects of the Black Death (1348-1349) had their adverse effects. Close inspection of records shows that vine-growing in Britain has ebbed and flowed with changing climatic conditions. The importance of climate is evidenced by the current upsurge of interest in grape-growing, coinciding with a period when (from 1970) average temperatures and sunshine totals have been increasing. From the late 18th century, grape cultivation in Britain was influenced by the use of special glasshouse vineries, often heated, in the kitchen gardens of large estates. The most famous vine is probably that at Hampton Court Palace, planted in 1768. Warm outside walls were also used. There are few records of the establishment of successful vineyards until the second half of the 20th century. Well before this, the passing of the great estates signalled the end of the superb cultivation of many of the highest-quality dessert cultivars. Only very few examples of these now remain, while the vineyard crops are destined almost exclusively for wine-making because the British climate is not conducive to growing dessert-quality grapes in the open. As Spain colonised vast areas of South America, so the vine was soon introduced there too. In North America, early efforts in the eastern states foundered on the ravages of Phylloxera vastatrix, an aphid that attacks the grape vine. This pest was not present in California, however, and vineyards expanded and flourished there. The vigorous California grape vines became the rootstocks on to which phylloxera-susceptible European vines were grafted in the late 19th century, thereby saving the great European vineyards from extinction. At about the same time, European vines were cross-pollinated with American cultivars, thereby producing phylloxera-resistant hybrids. 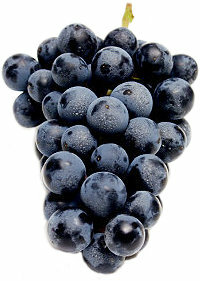 These are widely grown today, though some believe their grapes are of lesser quality than their European ancestors. The grape grown since pre-biblical times in Europe and Asia is derived from Vitis vinifera, the European wild grape (probably its subspecies sylvestris), and its cultivars still account for much of the present-day grape production. Classical writers such as Theophrastus, Cato and Pliny assessed the virtues of the many cultivars of their times and countless more have been selected since then. Several Vitis species indigenous to America – in particular Vitis aestivalis (the summer grape), Vitis rotundifolia (the muscadine) and Vitis labrusca (the fox grape) – have also been the sources of a range of cultivars. 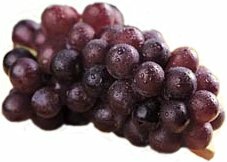 Vitis labrusca has received special attention with its hardiness and its ability to produce crops successfully in cooler climates, although its unusual ‘foxy’ flavour undertone is unacceptable to many. Vitis labrusca and its offspring are termed slipskin grapes because their skin slips easily from the flesh. In cool-temperate areas like Britain, a glasshouse, preferably heated, is usually essential for viticulture. The choice of glasshouse should be considered with care, since the needs of the vine often clash with the requirements of other plants grown nearby. There needs to be adequate space and ventilation and sufficient root run into a good growing medium, with surface access to it for routine top-dressing and watering. Without dedication to regular management, especially pruning and training, the vine will quickly get out of control. A lean-to structure is the most suitable with its greater straight roof expanse and with the back wall offering residual heat. This is of great benefit in an unheated glasshouse, particularly in minimising temperature drop at night. The soil must be sufficiently fertile, of good texture and well drained. If such conditions cannot be met, it may be advisable to grow the vines in a container (see below). Any drainage tiles must be 75cm deep and covered with turves before infilling with a prepared high-fertility loam-based mix. The vine can be planted inside or outside the glasshouse. If grown outside, the stem or rod is led through an opening in the base of the wall of the structure. (Planting the vine outdoors and bringing the stem or rod inside in this manner was widely practised in the past, although today it is less often done). An indoor root run requires a sophisticated watering regime and very regular attention; failure to water correctly results in cultural problems and lower yields. Although roots growing outside are less under the gardener’s control, the roots are likely to be buffered against dryness and will look after themselves for longer periods. Small glasshouses often have shallow foundations and a vine planted inside the structure will regularly extend roots both within and outside it. Planting is traditionally carried out in November or December, when open-ground plants are dormant, but container-grown specimens may be planted at any time so long as they are well watered beforehand. In small houses, planting at one end and training the vine up and along the ridge is popular; along one side is an alternative. Whatever way, relevant fittings on to which support wires can be fixed are essential. Ideally these should hold the vine 35cm away from the glass but less will have to suffice in a small glasshouse; the distance should never be less than 25cm. If there is space for more than one lateral, suitable extra main shoots are trained to wires at 1.2m intervals; they may be trained when young to any shaped required. The simple rod and spur method is usually used in glasshouse culture. After planting shorten the stem to about 7.5cm above the soil level or the graft union. (Note that winter pruning must be done by the New Year or soon after to prevent severe bleeding of sap; while such bleeding does not seem to affect the vine, it is best avoided). One leading shoot (also called ord or stem) should be allowed to grow and then be tied loosely to the wire the first summer. Laterals (also called rods or canes) from it are shortened to five leaves, and sub-laterals from these to one leaf. Should any competing leader develop, it should be removed. The first winter, the leading shoot is reduced by two-thirds of its length to well-ripened wood; laterals are pruned back to one bud from the leading shoot stem. The second summer, the leading shoot is again extended and tied to the wires, and treatment of laterals and sub-laterals is repeated. Any flower trusses must be pruned off – it is inadvisable to allow fruiting before the third year. In subsequent winters the leading shoot is shortened to ripe wood and later restricted to available space; laterals are repeatedly shortened to one bud, and with annual cuts spurs are formed. These become congested with age and will eventualy require thinning with a pruning saw. Whole spurs may need removing where spacing is less than 25cm. Where the laterals are trained at an upward angle, they should be cut loose and allowed to hang, or retied horizontally, in winter until growth begins. This ensures even growth at each spur, the laterals then being returned to their normal positions. As growth starts in spring only two fruiting laterals (also called rods or canes) must be retained at each spur. The weaker of the two is then pinched to two leaves and is kept as insurance against any accident to the lateral which will normally carry the crop. As this develops, flower trusses and usually also vine leaves will appear up to 60cm along its length. The tip of the fruiting lateral should be pinched out two leaves beyond the best flower truss, other trusses being cut out. If no flower truss shows, such shoots should be pinched at six to eight leaves. Any sub-laterals are pruned to one leaf and any tendrils removed. The third summer, just one or two bunches of grapes should be allowed, but in subsequent summers the number can be gradually increased, depending on the health and vitality of the vine; any sign of debility should be accompamied by removal of a large proportion of flower trusses. In general at least 30cm of stem should be allowed between each bunch. In professonal vineries the fruiting laterals are carefully tied down to support wires, a matter of some skill if laterals are not to break off at the junction with the spur. To assure minimum breakage, tying is done in the morning when laterals are more turgid, and tying is done gradually over several days. Such treatment brings laterals to a uniforn level and prevents contact with the glass which can cause scorching. Although most vines are self-fertile, some assistance with pollination is advisable under glass. Tapping the laterals around mid-day to distribute pollen will assist many cultivars but some, notably the Muscats, benefit from cupping the hands gently and passing them over the flower truss from one vine to another. Lightly dusting trusses in sequence with a soft brush is an alternative. Ventilators are opened to provide a cold environment until late winter, when ventilation is reduced to keep as uniform a temperature as possible to encourage early growth. At pollination time, limit ventilation to provide adequate warmth, but always allow a little, even in dull conditions. After fruit set, ample ventilation is required, particularly to reduce risk of diseases such as mildew and botrytis. Side as well as top ventilation is a great advantage. Damping down is advantageous, especially on sunny days, but should be discontinued during flowering and fruit ripening (to avoid fruit splitting). Mist-spraying of the foliage in early morning is advisable, but not on dull days, and should be stopped at the first sign of fruit ripening. Fruit thinning is essential for well-formed bunches of large berries. 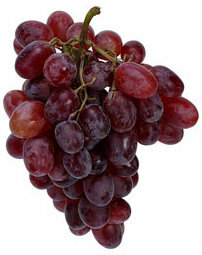 For this, special grape thinning scissors are used to remove smaller, crowded fruits withing the bunch. Using a small forked stick to separate individual sections of the bunch prevents the need to touch fruit by hand, which spoils the natural bloom. Some cultivars need a second thinning. Certain cultivars, ‘Fosters Seedling’ for example, produce much foliage and this should be thinned out by degrees from mid to late summer, mainly to allow more air circulation, especially to avoid mildew. Ripening fruit will, of course, be shaded to some extent by the vine’s foliage; additional shading is needed in hot weather – either by using a thin shading paint or external blinds. Where the root system is within the glasshouse, watering must be adequate to penetrate the whole soil profile, often at least 15 litres/m². A soil auger is an ideal tool for regular checks at various depths. Initially a thorough watering using tepid water is essential just before growth begins, and this may need repeating within a week where borders have dried out. Subsequent watering will vary with weather conditions, but generally vines in full growth require considerable and regular amounts. As fruit ripening approaches, watering can be eased a little, but the soil must remain moist; if it dries, skin splitting may occur when a further watering is given. This includes top-dressing in winter and fertiliser application in summer. The winter treatment involves light pricking over of the soil with a fork and the removal of its top 4-5cm layer, which is replaced by fresh, rich, soil-based mixture. Following the first waterings, a mulch of well-rotted farmyard manure or compost should be applied. Once active growth is evident, regular feeding with a high-potash fertiliser should begin; if growth is still unsatisfactory, a high-nitrogen feed is advisable. Feeding should be at two-week or three-week intervals but should cease as fruits start to colour. The ripening stage is critical. Too moist an atmosphere will cause splitting and disease, and failure to remove any unwanted shoots will lead to overproduction of foliage and, therefore, shade, and reduction in quality and flavour. Where the house contains other crops, care must be taken to avoid leaving the floor and border too wet. Muscats and other glasshouse grapes can be eaten as soon as they ripen, when they are moderately sweet, but it is usual to give grapes a ‘finishing period’ for full ripening; this allows sugars to form and full flavour to develop. Early-ripening cultivars like ‘Black Hamburgh’ will ‘finish’ in two to three weeks; later cultivars need at least twice as long. Good ventilation should be maintained and the ventilators may need a covering of fruit netting if birds are troublesome. The bunches should be harvested with a small piece of the spur attached to act as a ‘handle’ to avoid damaging the bloom on the fruit surface. This is vital where bunches are destined for exhibition. In exeptional circumstances ripe grapes can be left on the vine for some weeks, provided there is skilful use of a little heat and ventilation to provide a dry, airy environment. 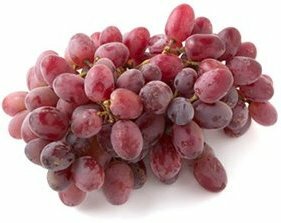 Dessert grapes under glass will produce one bunch weighing 35-45g per 30cm of rod. 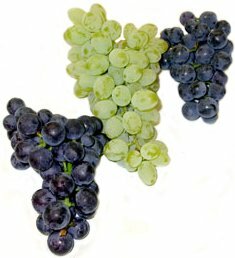 Grapes for glasshouse cultivation are classified in three distinct groups. (1) Sweetwater: these are early-ripening cultivars and therefore the safest choice for unheated houses, but they will not keep for long once ripe. Examples include ‘Black Hamburgh’ and ‘Fosters Seedling’. (2) Muscats: the finest flavoured grapes but normally requiring heated greenhouses. Bunches will hang for considerable periods if given background heat. Examples include ‘Muscat of Alexandria’ and ‘Madresfield Court’. (3) Vinous: because they are the latest to ripen, they will seldom be a sensible proposition unless adequate heat is available to mainatain the ripening process. Examples include ‘Alicante’ and ‘Gros Colmar’. Sheltered, warm sunny walls are essential for grape growing; the vines should be trained and pruned as for glasshouse culture. Timing of growth and maturing and ripening of the crop will of course be governed completely by prevailing weather conditions, but control of heavy growth by thinning and pinching and by annual pruning in winter will do much to ensure success. The double Guyot system is often used for training grapes on walls. In really cool conditions results will be progressively more variable, and only early-ripening cultivars should normally be considered. (See later for popular cultivars suitable for outdoor growing). Preparation for outdoor planting is as for glasshouse cultivation, but in general an average well-drained garden soil pH 6.5-7.0 is suitable. Difficult clay soils and extensively chalky ones should be avoided. Good drainage is essential. The soil should be thoroughly prepared, preferably by double digging to ensure adequate depth. Only where soil is poor should small amounts of rotted manure or compost be incorporated; otherwise excessive growth and delayed cropping will result. A 1-2-year-old vine should be planted 20-25cm away from the wall in holes large enough to allow for full spread of the roots. It will normally be done in winter in milder climates and in early spring in regions with cold winters. Some feeding may be necessary; the winter renewal of the top layer of soil with fresh soil mixture followed by a mulch (as for the glasshouse) will often suffice. Occasional balanced liquid feeds during the summer may also help, especially where growth is unsatisfactory; timely watering is often essential. Yields are comparable to those under glass, but will depend upon climate and the cultivar in question. In cool climates these will usually be destined for wine-making, although in some seasons acceptable dessert grapes will ripen. Most cool-weather grapes are white because the black cultivars require warmer temperatures. 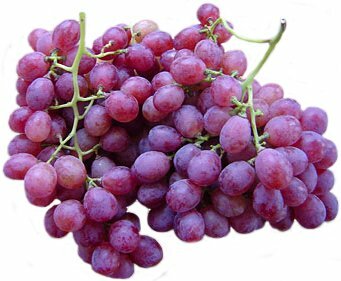 European grapes need sunny, warm conditions; American grapes will succeed in cooler areas with higher rainfall and cold winters. Climates with long, sunny summers and with some irrigation available where rainfall is deficient offer almost unlimited success in most seasons. Given suitable site and soil, most warm-weather gardens should be capable of growing one cultivar or another, the warmth enabling the production of high-quality dessert or wine grapes. Soil and planting considerations are as for growing grapes outdoors on walls. The outdoor vineyard is best situated on a south-facing slope that is not shaded but is well protected from winds; a vegetative windbreak may be necessary. Good drainage is essential; maximum annual rainfall should not exceed 800mm nor be in a frost pocket. According to climate and latitiude, certain altitudes should not be exceeded because they impose a minimum temperature limitation: in the UK this is around 110m above sea level, but further south in Europe, and in warmer parts of other countries, the permissible altitude increases. Equally there is a maximum temperature, around 90-100ºC in the shade, above which most vines will not fruit nor perform well. Planting distances will vary, depending on cultivar, soil and training method; a minimum of 1.5m is essential, but up to 3.6m may be necessary. The inter-row distance should be at least 1.8m with most training systems. Kill off all weeds before planting vines by deep cultivation, laying down a black plastic mulch, using a herbicide or growing a clean cultivated crop the summer before. To keep weeds under control in the planted vineyard, cultivate regularly but no more than 7.5cm deep to avoid damaging roots. A natural or black plastic mulch may again be used, but not on wet soil. Grass or other ground cover that can be mowed can also be planted under the vines to control weeds. If growth were not controlled, vines would grow many shoots in all directions with many small bunches of low-quality grapes that do not fully sweeten. They would be overcorwded, shading out the sun and encouraging pests and diseases. Good pruning and traing result in neat, well-spaced vines, often with just one larger and generally healthier bunch of grapes per fruiting lateral. There are two methods of pruning, spur pruning and rod pruning. Spur pruning, the type used in glasshouse culture, involves cutting back each year after harvest all of the fruiting laterals (also called rods or canes) growing from the main laterals to two buds, leaving a knobby stub or spur. Two new fruiting laterals grow from each of these spurs the following season. In rod pruning, the main laterals, not just the fruiting laterals, are cut back each year. Those main laterals that grew fruiting laterals the first fruiting season are cut back to two buds after harvest, and in two year’s time those two buds will grow replacement laterals. In the meantime, two new laterals that grew out that first fruiting season are left to grow to become the main laterals for the second fruiting season. Spur pruning is the simpler of the two and is used on most European grapes with the exception of Vitis vinifera ‘Thompson Seedless’. The annual renewal of main laterals by rod pruning is necessary for certain grapes that do not reliably produce fruit on laterals close to the main laterals such as many Americam cultivars and French hybrids. The grape is a very plastic plant and many systems for training grapevines have been used over the centuries, as Roman authors and representation in mosaics demonstrate. However, almost all of them can be grouped into two basic methods: head training and cordoning. A kind of fan training has been used in the US but is seldom employed today because of the congestion around the base of the plant it engenders. In head training the main stem grows to 1.2-2m high, depending upon the type of grape, and is tied to a stake. Up to six laterals are allowed to develop from the top half of the main stem, fairly evenly distributed so that they form something of a circle around the stem. These laterals are spur-pruned for the first few winters so that short arms or branches develop from which fruiting laterals subsequently grow. Once mature, the vine may continue to be spur-pruned, or it may be rod-pruned, depending upon the type of grape. No support other than the stake is needed for the spur-pruned vines. The fruiting laterals on rod-pruned vines are often left unsupported so that they hang down freely. Other times the replacement laterals are tied together above the head on a stake with the fruiting laterals hanging down, or the laterals are supported on either horizontal or vertical sets of wires. In this method, the main stem grows up to a horizontal wire. This stem is then pinched back to just below the wire and two shoots are chosen from all of those that then grow from the stem. These two laterals or cordons are then trained along the horizontal wire, one to the right and one to the left. Several variations on this basic cordon training are used, among the most common being the Guyot system, the Geneva Double Curtain (GDC) and the Kniffen system. This training system, favoured for European grapes, relies on the annual replacement of the laterals. A single lateral along the wire in one direction can be used (single Guyot), or more often one in either direction (double Guyot). Since the double Guyot is the more popular, it is described here. After planting, cut the vine down to two buds above the soil level or the graft union. During the summer allow only one shoot to grow up the vertical support. The first winter cut the vine to 40cm above the soil level, leaving three vigorous buds. The next summer allow only the three shoots growing from the buds to grow up the vertical support. The second winter, tie two shoots to the bottom horizontal wire, one to the right and one to the left, and cut them back to 60cm. Cut back the third shoot to three or four buds. During the third and subsequent summers train three shoots growing from the centre to 1.75m high. Pinch back any side shoots to one leaf. It is best to remove any flower trusses. The fruiting laterals that develop from them are trained up through the two sets of double wires. On these an occasional cross-tie can be inserted to prevent the lateral slipping along between the wires in windy weather. Laterals are pinched at two leaves beyond the top wire and any sub-laterals are removed. In late summer begin removing a little of the foliage that covers the fruit to encourage ripening and reduce disease, particularly botrytis. Rod-prune the laterals after harvesting and train the three replacement shoots up the support. Pinch back any side shoots to one leaf. These replacement shoots will grow fruiting laterals, and the cycle repeats itself. For this method a form of post and beam wire support needs to be provided. Stout 6-8cm treated posts 2m long are required, driven 60cm into the ground. On to these galvanised 12-14 gauge support wires are secured, one at 35cm, and at least two double wires, at 75cm and 120cm. Spacing of the plants should be 1.5m apart, with at least 1.3m between rows. This method, perfected in the US, is best for really vigorous vines because the vines must grow high up. French hybrid grapes are often trained this way. The advantage is that machinery and herbicides can be used more easily. Also, there is no summer pruning and no bending over for harvesting. GDC does require more land since yields are only 1-4 tonnes per hectare compared with 5-12 tonnes per hectare in the Guyot method. It often takes a year longer for vines to start bearing fruit because of the extra time it takes them to grow up high. 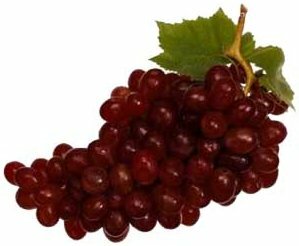 Ripening may be delayed in cooler climates, perhaps because grapes hang further away from the radiant heat of the earth. After planting, shorten the vine to two buds above the soil level or graft union. Allow the more vigorous shoot to grow up a vertical support and pinch off all other shoots. The first winter, if the shoot has grown 2m or more, cut it back to 1m high. If it has grown 1.75m or less, cut it back to 0.5m. During the second summer the main stems of vigorous vines will grow easily to the top wire, one to the right and one to the left, so that fruiting laterals can start to grow from them. Cut them back so that they don’t get too long too quickly. Cut off all other shoots. On less vigorous vines tie only one shoot to the wire; cut back the second and tie it on the next year. Every other plant should have its shoots tied to the other parallel wire to achieve the ‘double curtaining’ effect. Choose fruiting laterals that grow from the undersides of these main laterals and are about 20cm apart; prune them to three or four buds each. Allow them to hang down as they grow and bear fruit. Remove all other fruiting laterals. After harvest spur prune fruiting laterals to three or four buds. Because of the weight and height of the vines, this system needs very good support. Strong posts (such as railway sleepers or telephone poles) 3m long are driven 1m into the ground 10m apart. A 1.2m crossbar is nailed to them 1.7m from the soil level. Two galvanised 9-gauge wires are fixed to either side of the crossbars. Vines are usually planted 3m apart. This system is often used for training American grapes. Here there are two sets of main laterals per vine, tied onto wires, one at 0.6-1m and the other at 1.5-2m. The training for the first year is the same as that for Guyot. During the second summer allow the main stem to grow right to the top wire. Remove any growth that develops above the top wire and below the bottom wire, but allow laterals between the wires to grow. The second winter choose four strong laterals, two near the bottom wire and two near the top wire; tie them to the wires and cut them back to 10-15 buds. Choose four more laterals and prune them to two buds as replacement laterals for the following year. Remove all other growth. Fruiting laterals that grow from these main laterals are allowed to hang down freely, unsupported. The main laterals are rod-pruned in winter and replaced with strong new laterals that grow out of the main stem near the two wires; these are shortened to six to ten buds depending upon cultivar. Any surplus are removed. The support system should consist of 10 x 10cm poles about 2.5m long, driven 60cm into the ground, spaced about 6.5-7.3m apart. Galvanised 9-gauge wire is fixed to the posts at 1m and at 1.8m from the ground. Vines are planted about 2.5m apart. This is the same as the four-arm Kniffen system, except that three-tiered wire support is used, with one pair of laterals at each of the wires. The laterals are pruned shorter, usually with only four buds on each. Often each vine has two main stems instead of one. Because of their upright growth, this system is good for French hybrids and Muscadine grapes. Train as for four-arm Kniffen System but in the second year prune the main stem to 15-30cm below the top wire. Prune three to six fruiting laterals near the head of the stem to 6-10 buds. Allow these laterals to fall over the wire and hang down unsupported. Prune two additional laterals to two buds as replacement laterals for the following year. 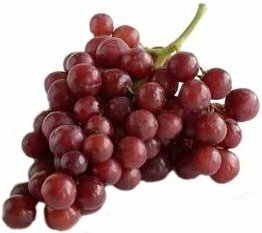 This is a popular system for many American grapes. Usually a vine is Kniffen-trained up and over one vertical side of a pergola (or arbour), horizontally along the top and then down the other vertical side. The number of pairs of laterals are determined by the number of crossbars on the pergola. A pergola will not yield as much fruit as other systems because the fruit is more shaded. In southern Europe and the Mediterranean vines are often grown on pergolas over outside dining or sitting areas, providing both support for the vine and welcome shade from the sun. German and French cultivars are best for growing in Britain. US cultivars do not generally succeed, although some of the French-American hybrids are acceptable: these have greater yields and wines mature faster, but they are considered to produce a lower-quality wine taste than the non-hybrids. Suitable cultivars for Britain include ‘Auxerrous’, ‘Bacchus’, ‘Huxelrebe’, ‘Madelaine Augevine’, ‘Muller Thurgau’, ‘Reichensteiner’, ‘Schonberger’, ‘Seyval Blanc’ (a French hybrid), ‘Siegerrebe’ (for both dessert and wine grapes) and ‘Wrotham Pinot’. 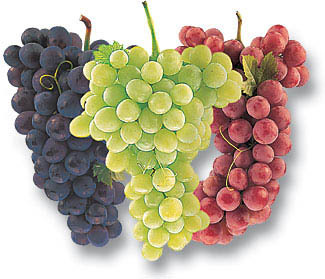 In the northeastern and midwestern US popular cultivars include, for both dessert and wine grapes, ‘Delaware’, ‘Fredonia’, and ‘Niagara’; for dessert grpaes, ‘Cayuga White’, ‘Reliance’ and ‘Venus’; for wine grapes, ‘Buffalo’, ‘Catawba Concord’, and French hybrids like ‘Maréchal Foch’, ‘Seyval Blanc’ and ‘Vignoles’. 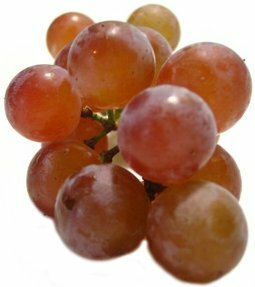 Dessert grapes commonly grown in Southern gardens include, among other cultivars, ‘Champanel’, ‘Ellen Scott’, ‘Fredonia’, ‘Lenoir’ and ‘Portland’. Some of the Muscadine cultivars are ‘James’, ‘Scuppernong’, and ‘Thomas’ (all have unisexual flowers so they must be planted near male plants); and ‘Burgaw’, ‘Druplun’, ‘Pender’ and ‘Willard’ (all bisexual so they are self-fertile). 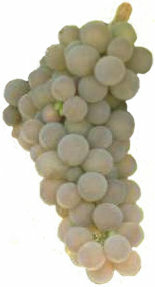 In California and other western parts of the US popular cultivars grown for dessert grapes include: ‘Emperor’, ‘Ribier’, ‘Thompson Seedless’ (also use for sultanas) and ‘Tokay’, Wine grapes include, among many others; ‘Cabernet Sauvignon’, ‘Chardonnay’, ‘Chenin Blanc’, ‘French Colombard’, ‘Merlot’, the Muscadines, ‘Pinot Noir’, and ‘Zinfandel’. Where phylloxera or soil-borne nematode are a problem, the only safe propagation method is grafting to resistant rootstocks. Grafting is a technique usually left to professionals, although there are several good references on the subject. In areas not affected by phylloxera or nematodes, most vines (except for Muscadine cultivars) can be increased by rooting cuttings. Hardwood cuttings taken in early winter can be rooted in the open, although this is not always reliable. They should be of one-year-old wood, 20cm long, cut immediatley above and below the top and bottom buds. Insert them 15cm deep in light, sandy soil; cloche protection is advantageous. The rooted plants should be ready for lifting a year later. With a cold frame, cuttings of the buds, inserted singly in 10cm pots in sandy medium, should be well rooted by early summer after being struck in midwinter. They can then be potted on. Rooting is further accelerated with the use of a heated propagating case or with bottom heat at around 18ºC. Single-bud cuttings are taken in midwinter, about 5cm long, cut just above the bud. They are placed individually in 7cm pots with the bud just above the sandy medium. In the past, 6-7cm cuttings with the bud in the centre and a sliver of wood removed from the opposite side were laid horizontally in pots, but this method is probably less reliable. The fastest rooting comes from green softwood cuttings from the previous year’s shoots taken in late summer. They should be 10cm long, cut just below a bud, and must include a second bud or the growing tip of the shoot. Inserted individually in 7cm pots in a sandy mixture with bottom heat around 18ºC, they should root in 6-8 weeks, after which they can be potted on twice before winter. In cooler climates they will grow faster in a cool greenhouse or cold frame than outside. Muscadine grapes do not readily root from cuttings so they are usually propagated by layering shoots or the current season’s growth in mid-summer. New shoots will grow in autumn and can be cut from the parent then. Where space is limited the cultivation of grapes in pots, tubs or other suitable containers can be considered. Daily attention to watering (often more than once a day) will be necessary during the growing season and regular annual top-dressing of the compost alternating with repotting is essential. Containers should have a minimum diameter of 30cm, the bigger the better subject to movability. If plastic containers are used suitable drainage holes must be made in the base where necessary and these should be covered with a layer of broken crocks which in turn are ideally covered with broken fibrous turf. The container is then filled with a high-fertility soil-based medium in preference to a peat-based one. The soil contains a whole range of essential plant nutrients necessary for maintaining healthy balanced growth as well as making the container more stable with its weight. Where practical, a containerised vine can conveniently be moved in and out of a glasshouse, conservatory or on to a sheltered terrace to aid growth and ripening. Cultivation is similar to that of glasshouse vines, developing a permanent rod which is spur-pruned each winter. A suitable support for the rod will be essential; its maximum height should be about 1.75m. A mulch of farmyard manure plus regular feeding as for glasshouse crops is advisable for best results. Timely watering will be needed once growth begins, but this should be reduced as grapes begin to colour. Overcropping must be avoided; a 1.75m rod should only be allowed to carry five or six bunches. Repot in midwinter every two or three years. After carefully removing the soil ball fom its container the old medium is gently combed away from the roots with a hand fork and any pieces of old root pruned back to facilitate repotting. As much fibrous root as possible should be retained and the vine firmly repotted in fresh potting medium into a clean container. For the first two years, vines should not be expected to bear fruit; flower trusses should be removed so as not to rob strength from the maturing vines. By the third year vines will start to produce grapes and come up to their full potential in the fourth or fifth year. Yields vary depending upon the type of grape, training method and climate. Harvest by cutting the stems of each cluster with a knife or secateurs rather than trying to snap them off. During ripening the levels of sugar within the grapes rises as the acidity levels fall. Tasting dessert grapes may be all that is necessary to determine if they are ready for harvesting, but for wine grapes maturity is usually judged by the sugar-acidity ratio and also the pH and Brix-acid ratio of the fresh pressed juice. Two of the biggest pest problems are birds and wasps. Some growers find that scaring devices like bangers and objects that blow in the wind or float close above vineyard provide some, although limited, control of birds. The only sure way of keeping birds off ripening fruit is to cover the fruit with netting. If the netting is fine enough it will keep wasps away as well. Sometimes beer traps are effective against wasps, but finding and destroying the nests at night while wasps are inside is the best way of controlling them. Some growers use a chemical spray against wasps, but this should be used with great care because it may also destroy honey bees. In the glasshouse, dwarf lavender bushes are reputed to deter wasps. Where rabbits are a problem it is advisable to put up a rabbit-proof fencing around the entire vineyard or use wire netting or plastic tubes around the bottoms of the vines. If deer are a local pest special precautions will be needed. The two diseases that most damage grapes in Britain are powdery mildew or oidium, and downy mildew or peronospera. Other diseases that may affect grapes elsewhere and to a lesser extent in Britain include anthracnose, bacterial blight, black mould rot, black knot or crown gall, blue-mould rot, botrytis or grey mould, fanleaf and leaf roll. 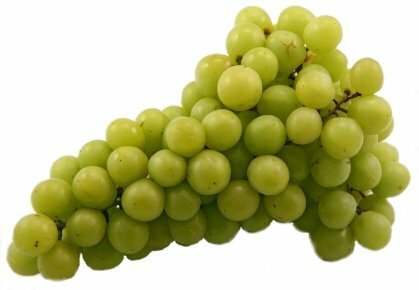 Shanking, a condition that causes berries to shrivel and sour during the ripening period, can be a problem with glasshouse grapes; it is most likely caused by overcropping and poor drainage. 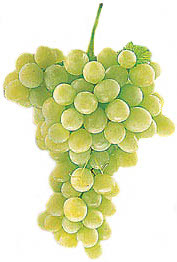 Sunscald may appear on glasshouse grapes that are still moist from overnight condensation when strong morning sun shines on them; improved ventilation will avoid condensation and shading during that period is also helpful. Insect pests that can be a problem, particularly in the US, include cutworms, greenfly and whitefly, grape berry moth, leafhopper, mites, red spider, soil-borne nematodes and vine weevil.